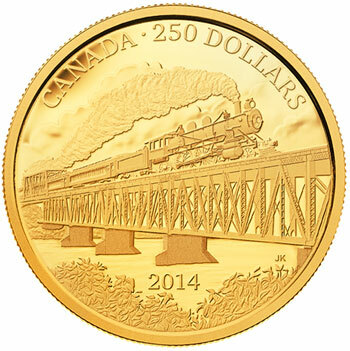 The Royal Canadian Mint has released gold and silver coins to commemorate the 100th anniversary of the completion of the Grand Trunk Pacific Railway, a historical Canadian transcontinental railway that linked eastern Canada to the Pacific. Construction began in 1905 with the last spike ceremony marking the completion of the rail line taking place on April 7, 1914. Both the gold and silver coins are issued in a rarely used 2-ounce format with uncommon denominations of $30 for the silver coin and $250 for the gold coin. 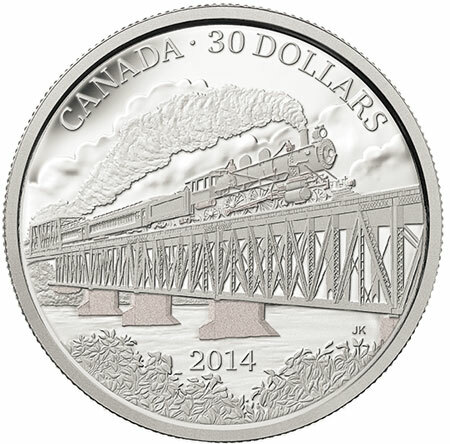 The reverse design of the coins by Canadian artist Joel Kimmel features a portrait of a 1914-era steam train as it crosses the Grand Trunk Bridge in Saskatoon at the time of the railway’s completion. The steam engine bellows a long cloud of smoke as it pulls elegant wooden passenger cars. The vantage point of the portrait is from the foliage lined shoreline and slightly below the left side of the train bridge, adding to the drama and grandeur of the scene. The obverse of the coins carries the Ian Rank-Broadley effigy of Queen Elizabeth II. The silver coin is struck in 99.99% purity in proof quality with a weight of 62.67 grams and diameter of 54 mm. The maximum mintage has been established at 5,000 pieces. The gold coin is struck in 99.99% purity in proof quality with a weight of 62.34 grams and diameter of 42 mm. The maximum mintage is 300 pieces. Each coin is encapsulated and presented in a maroon clamshell with black beauty box and serialized certificate of authenticity. For additional information on this and other coins offered by the Royal Canadian Mint, please visit the new releases section of their website.